These days people consume media in different ways. 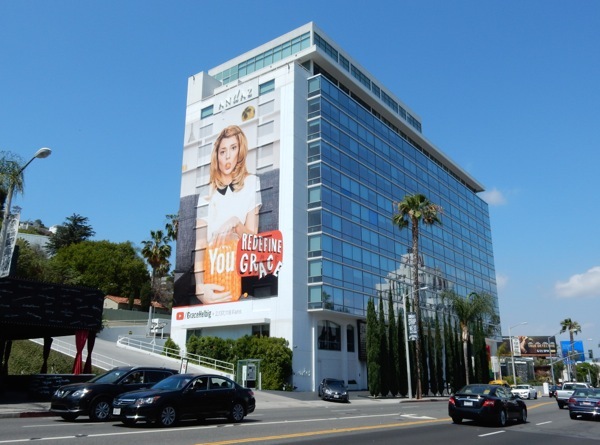 You're not just force-fed what the TV networks put on your screens, but you can cherry pick what and where you watch, and the choice is seemingly infinite. It's like having an endless supply of cheese balls to pop into your mouth, but of every shape, colour and flavour. 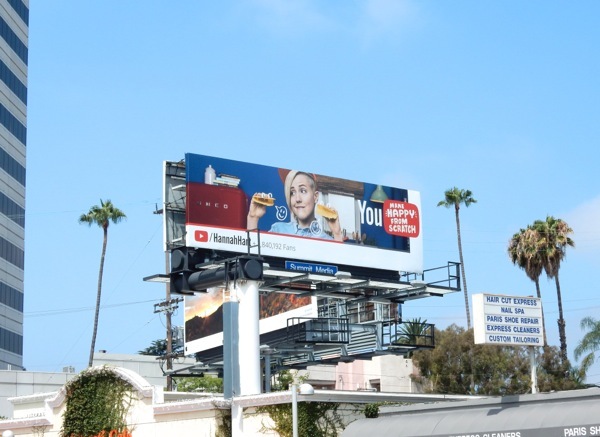 In recent years YouTube has gone from a place to find funny cat clips and viral videos, to a non-traditional platform offering original content and whole host of inventive people producing their own shows and web series (or at least that's what they want to be perceived as). 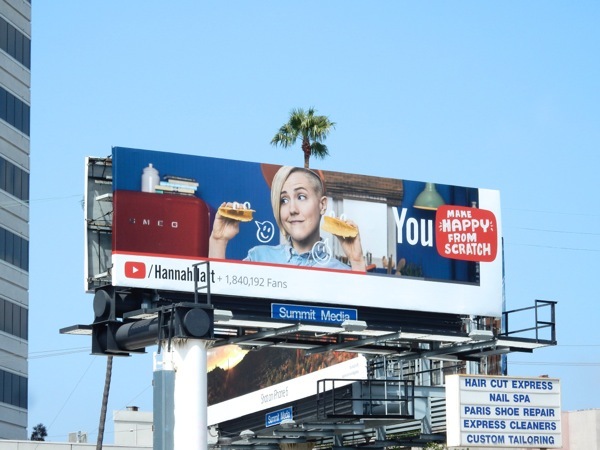 Grace Helbig and Hannah Hart are two such creative internet personalities having the spotlight shone on them and their YouTube channels at the moment in the skies of L.A. (and other cities). 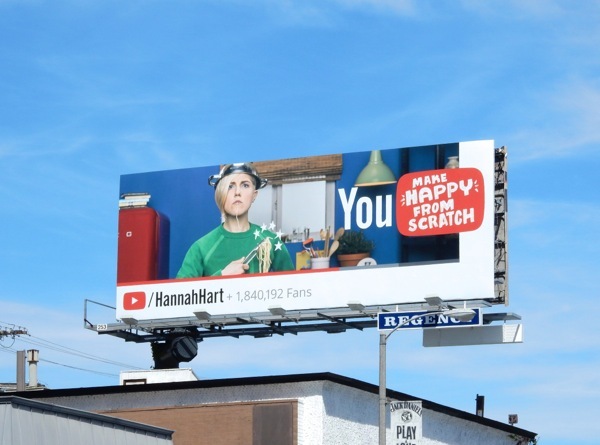 The two funny ladies both have a huge following with YouTube's teens and tweens audience for their respective shows and unique brand of humour, and now it looks like they're hoping to appeal to a wider audience and YouTube hopes to to reinforce that it's a destination for where you get your comedy fix. 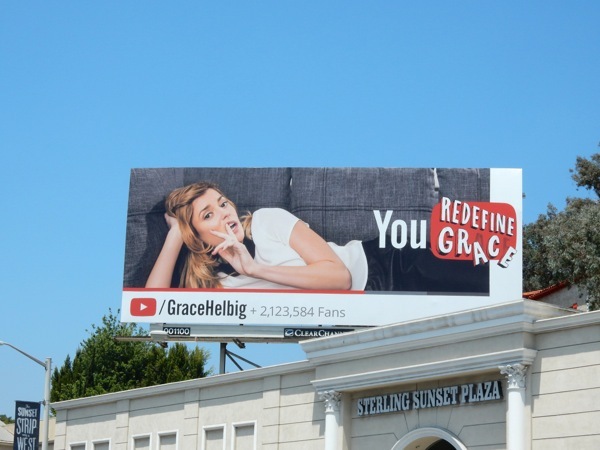 These 'You Redefine Grace' and 'You Make Happy From Scratch' landscape billboards were first snapped along L.A.'s Sunset Boulevard on April 29, 2015. 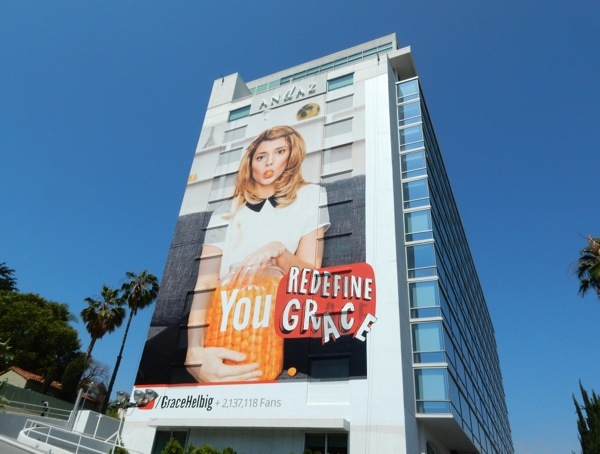 Meanwhile the fun super-sized Grace Helbig billboard was snapped on the side of the Andaz Hotel in West Hollywood on June 5, 2015. 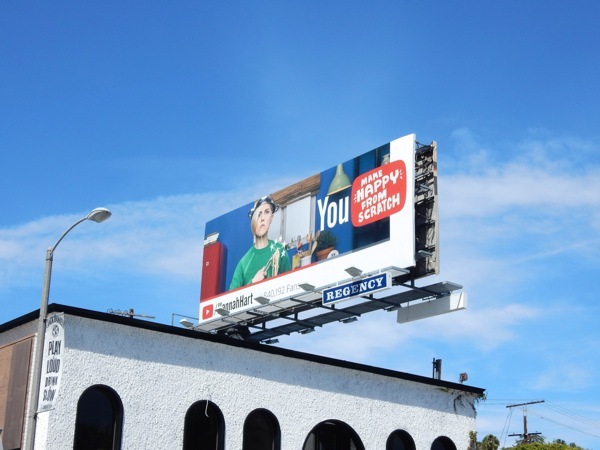 If you like these ads, be sure to also check out these 2015 YouTube Music Awards billboards and Video Game High School billboards, which demonstrates that YouTube has been trying to reach out to a wider universe beyond the interweb in recent times. 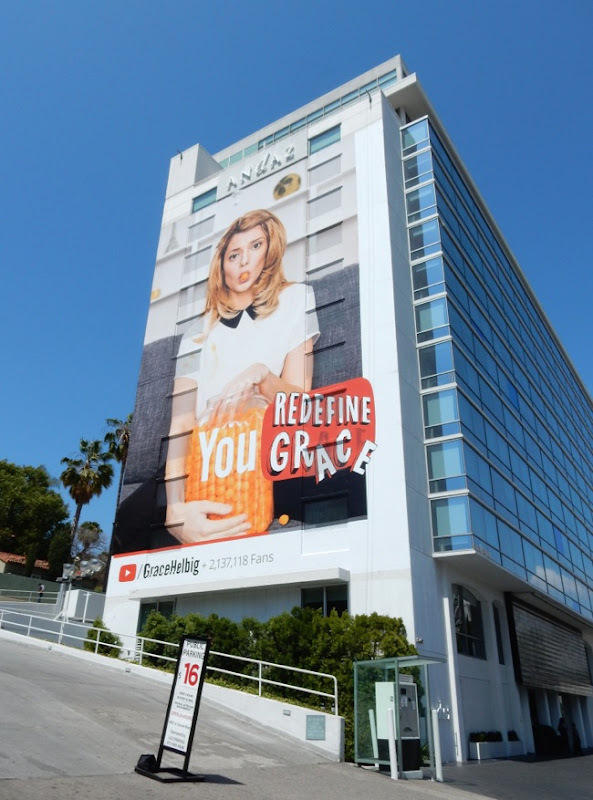 Whether you like being entertained by humorous personal vlogs, or watching someone cook whilst they're slightly intoxicated, YouTube is obviously the viewing platform for you. If all else fails, grab yourself a giant jar of cheese balls and make your own happy from scratch. 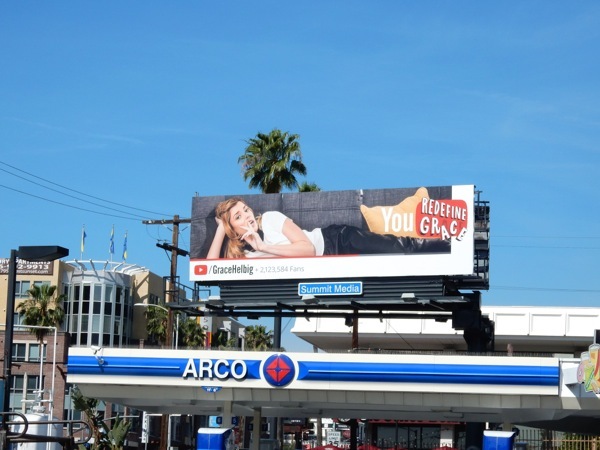 UPDATED: If anyone was thinking it was a bit unfair that Grace Helbig received more billboards than Hannah Hart, or 'Harto' to her fans, here's another fun ad creative for the YouTube star. 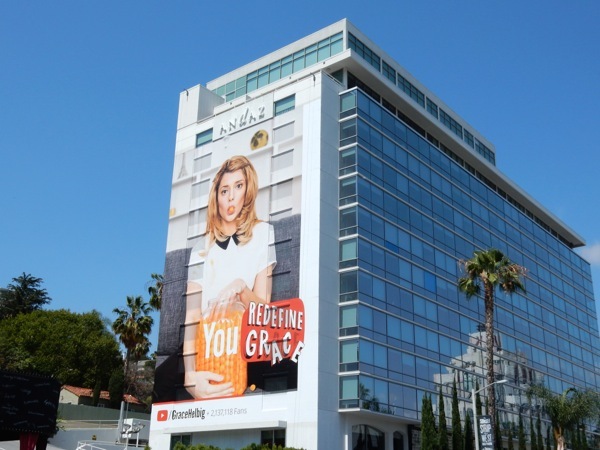 This talking taco shell billboard was spied along Wilshire Boulevard in Brentwood on July 4, 2015. 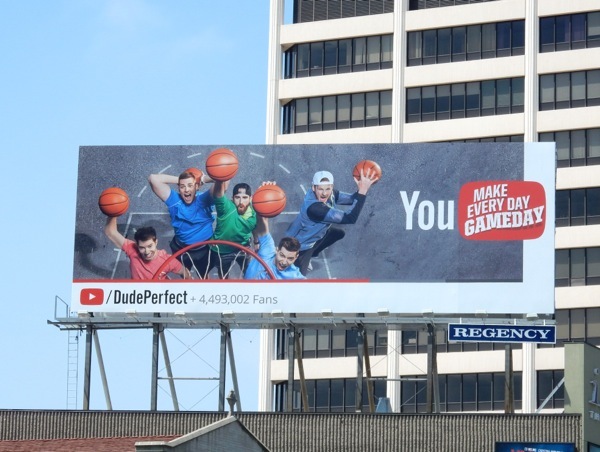 And if you thought these girls were having all the fun, then maybe this dose of testosterone from Dude Perfect and their YouTube channel with its unique blend of sports and comedy. 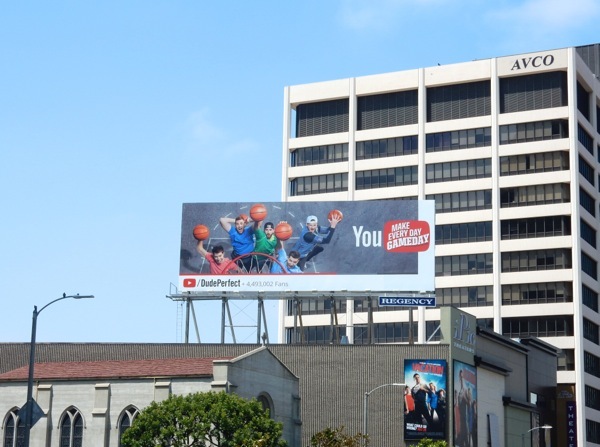 This basketball-themed billboard making every day game day, was spied further east along L.A.'s Wilshire Corridor on July 4, 2015.